Like I've said before, I don't think I am deserving of any Mom of the year award, but I definitely strive to be the best mom I can be. It has struck me pretty hard lately how fast Isabel is growing and changing right before my eyes and I do not want to miss one second of it. So, I had two goals with the project I did this evening - our den was in need of some pizazz, and also, I wanted a visual reminder to be here, in the moment, absorbing every new thing Isabel learns and all those amazing facial expressions she has. Put away the iPad, check my email later, take my eyes off the tv, and really live in the moment. This is a very simple and inexpensive project. I do not believe that there is such a thing as an uncreative person (hmm, maybe I'll write another post about that sometime), but if you are one of the people that subscribe to that lie, even you can do this project! First, print out the letters you want to use. I had to use two printed pages to get all my letters... Kinda like we did with the banners we printed to use at birthday parties when we were 8. Tape the pages together if necessary, and then tape these pages to the white paper. 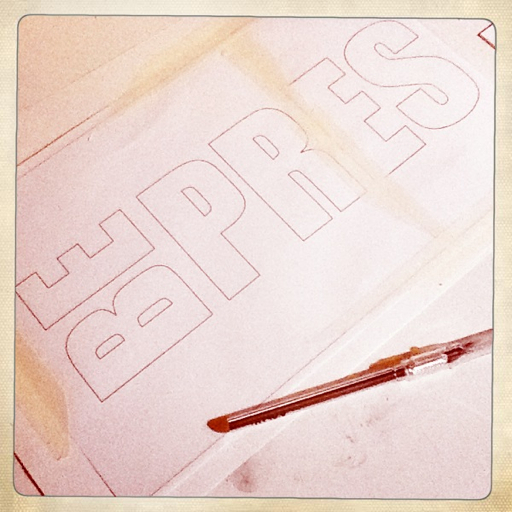 Using the Xacto knife, carefully cut out each letter. For letters such as the Uppercase R, make sure you save the hole in the middle to use later. 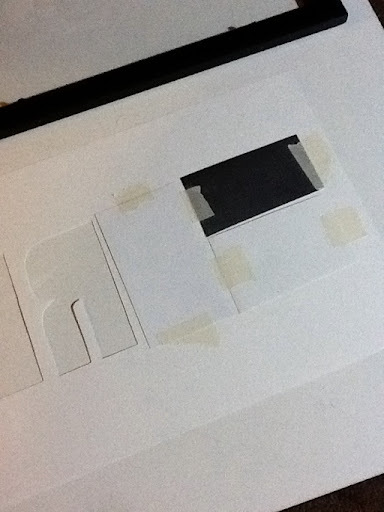 Chose what paper you'd like to use and tape it on to the back of each cut out letter (see the picture above). Use either a small piece of tape or a glue stick to adhere the center pieces of the letters with holes on the front of the paper. Put your creation in the frame and there you have it! 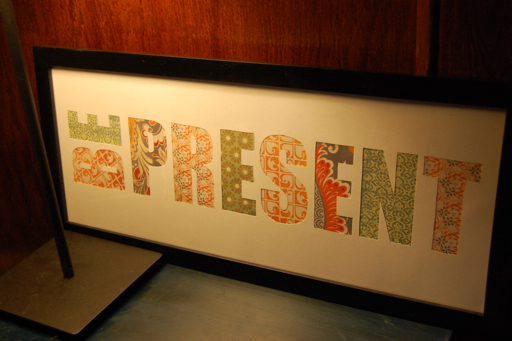 Awesome art and a great reminder every time you see it to be present and in the moment.